The Concierge Genius Bar application for retail employees has been completely redesigned for both the iPad and iPod touch. The application has a new “dashboard” view. The left side of the app is a list of different work (whether that be iOS device or Mac work) that employees are assigned. The right/middle pane of the new app shows the different appointments within each type of Genius Bar work. 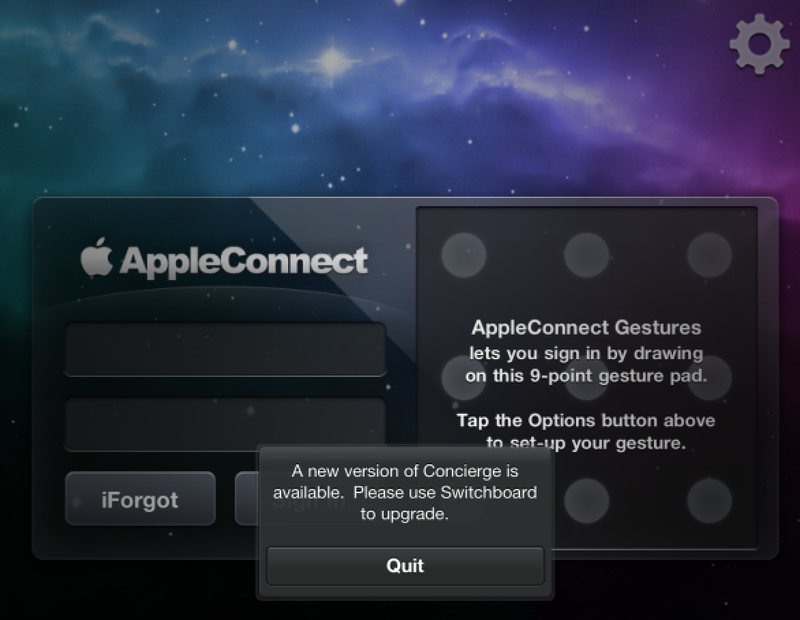 Concierge is the app that retail employees use to check in customers for Genius Bar appointments. Now, employees can log in a customer or mark a customer as late to their appointment with a quick swipe gesture. There is a new calendar section within the new Concierge app that notes all the upcoming One-to-One appointments. It’s now easier for employees to register and view upcoming appointments. The same thing goes for booking a customer into one of the workshop sessions that retail stores offer. Perhaps the most important new change in Apple retail software is the new “Session Manager” system. Session Manager is not in its own application or website, but it’s built-in to the new Concierge app. Session Manager allows Genius Bar customers to have their appointments assigned to individual Genius Bar employees. Now, customers are pre-assigned to an employee, rather than employees pulling in people off of a list after they finish with their current customer. This is a much more streamlined process for both the Apple employee and the Genius Bar customer. If employees are running late with a customer, the Session Manager will be able to pass over the upcoming appointment to an available Genius or to a Genius who is finishing up their current work. Session Manager presents a stronger focus on customers making formal appointments, rather than walk-ins. Employees are encouraged to work with people who have setup employees. On the other hand, the experience for walk-in appointments has improved as well. Instead of ten minute scheduling intervals, employees can book appointments to begin every five minutes (depending on available Genius Bar staff per day or per store). This is known as a buffer system that depends on current store conditions and how long appointments are running. This new buffer system includes a one and a half hour maximum wait time for walk-in appointments. Another big change, which will roll out on August 6th internally, is that a new system will come in place for the employee work lists to be automatically created. Right now, Geniuses assign their own work lists for appointments created by customers online. Like with the iTunes Store, iMessage, and iCloud today, the new internal retail systems were running into server issues. Apple is rolling out these internal retail changes gradually to avoid further issues. Another change is that the Genius Bar itself will showcase a larger focus on fixing Macs. As Apple has been rolling out for sometime now, Apple wants iOS device Genius Bar work to happen in the main store area, not the Genius Bar. This will be even more emphasized now. In all, while seemingly small, these changes equal a major renovation for the Apple Genius Bar employee’s workflow. Additionally, customers will be benefited with a more streamlined experience and less waiting for help with their iOS and/or Mac devices.